Dog dental care and cleaning is so important for the overall health of our dogs. It’s not just a matter of stinky dog breath—it’s a matter of good health care. According to The American Veterinary Dental College, periodontal disease is the most common clinical condition occurring in adult dogs by three years of age. Periodontal disease in dogs is a pretty serious business. Some symptoms include bad dog breath, bleeding or inflamed gums, missing teeth, not eating, and sensitivity around the mouth, which can lead to behavior problems. If left untreated, periodontal disease can cause heart disease, kidney disease, and liver disease, and a dog’s jaw can even fracture. As you can see, good dog dental hygiene is much more than preventing bad dog breath. The good news is that dog dental disease is usually preventable with a good dental program in place. Most veterinarians recommend cleaning your dog’s teeth at least once a day, twice being ideal. The goal is to remove the bad bacteria that cause tartar build-up, which leads to periodontal disease. Providing your dog with healthy chews such as raw meaty bones is another way to help remove daily plaque, but this should be in addition to using a natural dog dental product, not instead of. A dog may also have regular dental services under general anesthesia from his veterinarian. Dexter had a dental about two years ago. I try really hard to clean Dexter‘s teeth every day, but admittedly, I’m not perfect. 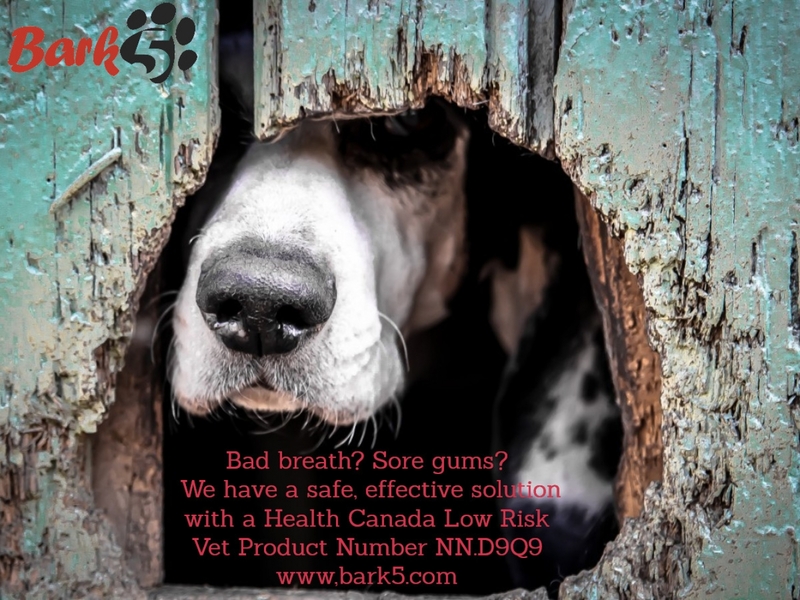 Bark5TM is a natural, alcohol-free dog dental spray. The company takes our dogs’ health to heart by ensuring the ingredients used in their pet dental spray are registered though the Low Risk Veterinary Health Products Notification Number in Canada! That’s pretty impressive. But, as with everything I use with Dexter, the first thing I do is check the entire ingredient panel to ensure each ingredient is safe, especially with dental products. Dog dental products are notorious for including very unsavory ingredients. Bark5TM Ingredients: Distilled water, grapefruit seed extract (citrus paradisi, seed, pulp), grape seed extract (vitis vinifera, seed, Propolis (vegetarian Propolis Erba Vita Soluble Propolis) containing propolfenol) Note: all ingredients are human grade and water-soluble. The product is actually blended when ordered to make sure it’s fresh. How cool is that? Not for use in animals on anticoagulants or for use in combination with antibiotics. I will be the first one to admit I am not a chemist, and I had to research some of the ingredients above to see what they were. And that’s okay—it’s part of my job as a Dog Mom. I thought it was fun to learn about some of the ingredients used and why they are so helpful in a dog’s dental product. Bee propolis has healing agents to help fight inflamed gums and loose teeth! Grape seed extract is anti-allergen, anti-inflammatory, antioxidant, and antimutagenic. It is highly effective for canine dental care and gingivitis. Distilled water is used in Bark5TM dental spray for dogs because it has no chemicals or heavy metals in it. Everything else also checked out safe and has dental benefits, so Dexter was ready to go with his review of Bark5. Since Dexter is starting to get some tartar build-up, I decided to use the extra-strength dental spray daily, and twice a day when I remembered. Bark5TM is the first dog dental spray I’ve used straight into Dexter’s mouth, so I introduced it slowly. It’s important to make sure not to scare your dog or get the spray in your dog’s face. If your dog is uncertain, spray your palm and allow your dog to lick it off. You can also spray an empty dog food bowl. Dexter seems to enjoy the taste, so it shouldn’t be a problem. After Dexter’s 3rd application, we found our groove. About an hour after breakfast and just before bed, I put on Dexter’s dog snood, lifted his lips and sprayed the back side of his molars and the front of his incisors. It’s pretty simple and quick. After ten days, I have noticed a lightening of Dexter’s plaque. The company states that it may take up to seven weeks to get very bad plaque off. So I’m delighted to be seeing results this soon. For the purpose of this review, I have not done any other dental care for Dexter, but the company does say brushing or scraping is a fine addition and can help remove plaque quicker, so I will add that to Dexter’s dental care. I am very happy with the results so far with Bark5TM alcohol-free dental spray! I will continue to use this natural dog dental product in Dexter’s daily dental care regimen. I love finding dog brands that have such a strong focus on the health and safety of our pets. Don’t let dental disease happen to your dog—visit Bark5TM today and use promo code: TW20 for 20% off your first order!